You know, those decisions that you are going to have to live with for a while, sometimes longer than you want. It seems like the right idea when you are in need of an item, later you realize it was not the best idea. Or maybe you are very young and you have no idea what your personal design style is yet…that was me when I picked out this couch and chair for our very first home. I knew I wanted a reddish color couch that was solid. We were also looking for a BIG comfy couch. When Will and I first got married we had hand me down furniture and had been given a master bedroom set as a wedding gift from his parents but we had no living room furniture. Well, I take that back, we did have Will’s college apartment couch that he shared with two other roommate's that looked like it was from the 70’s. Not happening! So we needed living room furniture quick. We went to a very GOOD furniture store and picked out this couch and chair and they are both solid pieces. The furniture store was about to close up for the day, the custom fabric order took 4 weeks to come in and so once we found the style we wanted we had to pick the fabric quick and get it ordered. The color for the couch was perfect at the time, it was just what I wanted. The green on the chair was a quick decision, it was August, must have had watermelon on the brain. Fast forward to now, I know my decorating style better and I would have gone with something way more neutral! I am having to work around it in other areas of our home. The house we are in now is open to the kitchen and dining room so I have to be careful how I chose colors for those areas. I am trying to buy things that are more my style and I love whites, blues, browns with small pops of color. 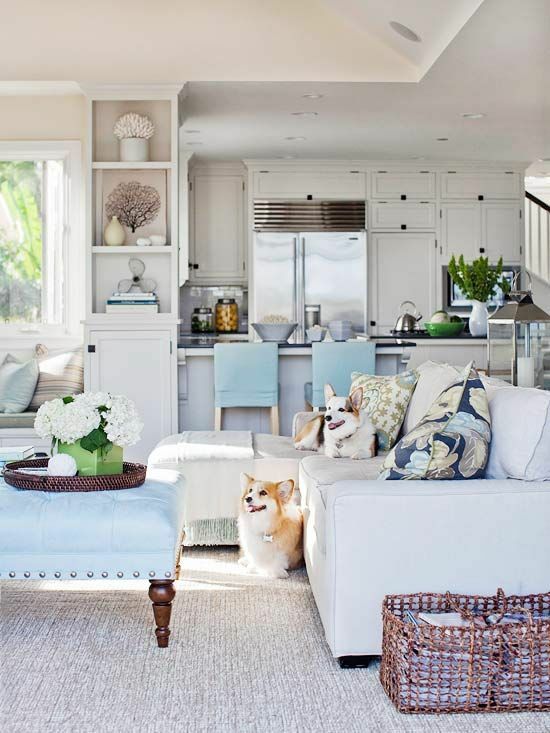 I love a coastal or cottage look. My favorite store for inspiration is Pottery Barn. Couches are expensive so….I have to work with it for now. The kitchen is right beside the living room. Our kitchen has very dark cabinetry so I am trying to keep things on the counter top minimum and add clear or white accents. I did purchase the rug from World Market when we moved in, it has the same colors of the couch and chair and also purple which matches my dishes and Kitchen Aid mixer, which stays out. I am having a little more trouble decorating the dining area. The small chair I had recovered a few years back and it was in our living room before, I thought bringing it over to this area helped tie the colors together. I had a lot of trouble choosing the color for the china cabinet because I wanted the blue but it really doesn’t go with the living room furniture. It’s a work in progress but it’s ok for now. I’m considering bringing in my round table with these dining chairs and adding some artwork. As for the couch and chair, we hope to one day use it in a bonus room because it is very comfy and great for lounging. Maybe one day it will look like this…. What design decisions do you regret? Do you have issues with choosing color over neutral? Oh and if anyone is wondering... The couch and chair came from Whitley Furniture Galleries in Zebulon, NC. Awesome selection! A coffee table in the living area maybe.. and possibly a rug under the table. Just a thought. You could always get some white slipcovers! That would definitely get you closer to the look you were going for. Then you could add some color with pillows, ottoman, rug, etc! Why not take the couch & have it facing the fireplace & TV. Try putting the desk from the dining room behind it and moving the green chair where the floor lamp is, with the white table next to it. In the dining room hang the mirror on the wall where the china cabinet is and move the china cabinet to where the desk is. Just an idea. I was thinking some similar thoughts. Some changes in furniture arranging will do your home well.